Mine: Sure it is riduculous, but it is still fun. The NYC settings are good. The villian is fun. It never takes itself seriously. Willis and Jackson are good together. 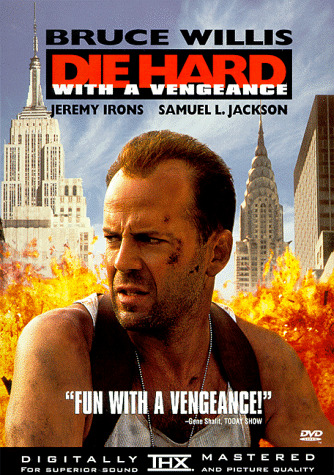 Leonard Maltin/Plot synopsis: A madman (Irons) holds N. Y. C. hostage with bombings--and threats of more--targeting his demands at ousted cop John McClane (Willis), who inadvertently acquires a partner in hostile Harlem storekeeper Jackson. Logic and motivation take a backseat to big-scale action in this nonstop roller-coaster ride; it's like watching 12 chapters of a high-tech Saturday matinee serial all at once. Panavision.